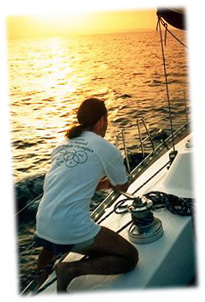 Charters are available in the Dodecanese Islands region. Charters normally start/end on either a Saturday or Sunday. Embarkation is 5pm, disembarkation is 9am. Other days may be available upon request (eg, for 10 day charters). Yachts are delivered filled with water, cooking gas and diesel; it is the charterer's responsibility to return the yacht with water and diesel tanks refilled. The boats should likewise be returned in the same clean condition as they were upon embarkation; alternatively, a cleaning fee may be paid. Charter parties need to have one fully qualified skipper, plus one other competent crew member aboard. Upon booking, clients sign a standard charter agreement (required by the Greek government) which details these conditions.